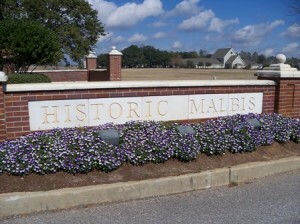 Historic Malbis rests on 150 acres of prime real estate, just south of Interstate 10 in Daphne, AL. Commuters to Mobile or Pensacola, can be on the interstate in mere minutes. This ideal location also allows residents of the subdivision to be no further that a few minute drive from all the essentials of daily life, to include department stores, a wide array of dining options, banks, schools, car dealerships, etc. Avid golfers will love the fact that the Timbercreek Golf Club is less than a mile away and features 27 holes of championship golf, designed by Earl Stone. This is a garden home style community, with rear entry garage or carport access provided via alleyways behind the homes. The standard lot size is 100×150 and privacy fences are allowed. The community is very walk-able and you will find many of your neighbors waving to you from their front porches during a morning walk or later afternoon jog. The current median asking price for active homes for sale is just under $300,000. Tour Historic Malbis Daphne AL homes for sale with the Jason Will Real Estate Team 251-866-6464.